This short, steep trail offers views of Diamond Head, Miller Peak, Navaho Peak and the Enchantments. It is especially scenic in the fall when the western larch needles turn bright yellow. 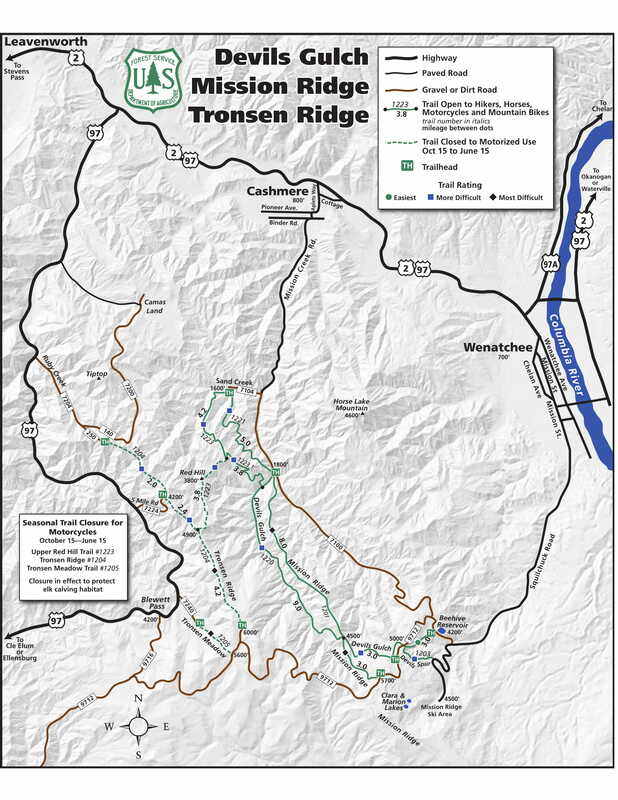 It provides access to Tronsen Ridge Trail. The trail begins at the Tronsen Meadow Trailhead located off Highway 97 on Forest Road #7240 and ends at the Liberty-Beehive Road #9712. For the Tronsen Meadow Trailhead, from Leavenworth, WA, head east on US Hwy 2 for five miles to US Hwy 97. Take Hwy 97 south for about 22 miles to the junction with Forest Road #7240 on the left. Take Forest Road #7240 for about 2 miles to the trailhead. The final mile is a rough road.